You can add an adjustment layer through the menu at the bottom of the Layers palette (click the fourth button from the left, and then move the cursor to the type of adjustment layer that you want to add) or through the LayerONew Adjustment Layer submenu. The choices are the same. When you select the particular adjustment that you want to add from the bottom of the Layers palette, that specific adjustment dialog box opens. 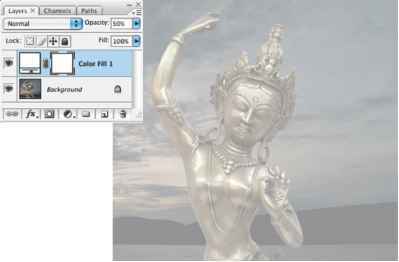 Selecting the adjustment through the Layers menu presents you with the New Layer dialog box first. You can see all these various bits and pieces in Figure 8-20. The top three options in the menu that you open from the Layers palette are fill layers — layers completely filled with a color, gradient, or pattern. You could add a new empty layer and use the EditOFill command to do the same thing, or add such a layer through the LayerONew Fill Layer menu. 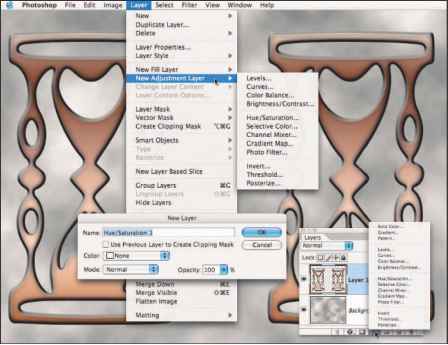 Figure 8-20: Adding adjustment layers from above and below.